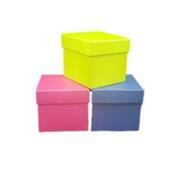 This is a range of standard size boxes, manufactured from 1200 chip board. They are covered in Wibalin paper and there are a large number of colours to choose from. You can mx sizes and colours. Lead time 7 to 10 days.